You've made the choice to join the team and therefore have made the decision that normal is not an option. Average, is not in your Future. This GRIND is nothing new to you. You are not on some fad diet or short-term workout plan. This is your LIFE. The hustle, the hard work, the dedication, the pain and the HUNGER to get to be where you want to be is nothing new. While you are PROUD, you are NEVER satisfied and that is what sets you apart from the rest. While they sleep in, you train, while they party, you lift, while they eat, you STAY SHREDDED. This GAINSCO Life is not for everyone. Only the few, only the chosen. As a GAINSCO athlete you continue to make changes as you grow, you LIFT harder, SUPP harder and EAT cleaner more and more everyday. You are finally understanding who you truly can become. Your old Hero's are now your new peers. You are treating your body better and in return are operating at a higher level of efficiency and its showing. You are now fueling it properly thanks to your Division Supply Co Supplements. As you enjoy the healthier new you, the STRONGER, LEANER and all around More FIT version of you, you are now more aware of everything you are eating and drinking. You keep a detailed breakdown of your nutrition and you have daily supplementation checklists logged every hour of the day. You are always holding yourself accountable, and we will to. We will continue to do our part to help you STAY ALPHA. Our team Newsletter will keep you updated with NEW workouts, NEW training techniques, as well as NEW tips in Diet and Nutrition. This is where SCIENCE meets GAINS. Lets talk Supplementation first, we will cover Training and Diet as well. We want to cover all the bases. Together we can Motivate the world! We LIFT hard, we SUPP hard, WE SMASH GOALS and WE KEEP OUR GAINS. The only way to keep our GAINS is to never take a day off. Wake up, the day starts, I'm supplementing from the second I wake up to the second my head hits that pillow that night. To keep GAINS, you need to Keep your supplement game strong. That is why we created the fully customizable STAY ALPHA Package. It offers you the supplement of your choice at discount and even throws in the T-shirt or tank top of your choice with a free Blender bottle! We all know we can use a new top and a FRESH smelling new blender bottle any day of the week. So why not get them for free when re-upping on your Supps! Choose your STAY ALPHA Package by what Shirt or Tank you want first! Then Custom pick the supplement to go with it! USE the Code "GAINSCO" at checkout to get the discounted Price! Click the image to view the STAY ALPHA Packages! Use TEAM CODE GAINSCO at checkout to get our special deal! Next, Lets talk Training. We get A LOT of emails asking for a Back Day Training routine. So, here is a SOLID one that will deliver results! Too many people forget about their back. You can't see it in the mirror very well, but a big, ripped back is absolutely necessary to building a symmetrical physique. Even if you don't have to worry about a competition-ready double-back biceps pose, it's worth your time to build wide lats and strong rhomboids. Width comes from a large back. Make it your goal to increase your pull to match the strength of your push. While you're definitely focusing on hypertrophy and physique during this trainer, it doesn't hurt to find balance in your strength levels. If you can bench press 100 more pounds than you can deadlift, set the goal of raising that second number before you're done with this program. BACK DAY! LETS GO! Choose a weight that you can warm up with 12-15 reps for your first set of 10, and work your way towards your max for your third and fourth set depending on if its a 3 set or 4 set workout, just make sure your final set is your max. Remember you have strong days and weaker days, adjust weight to your daily needs to make improvements in strength and gains. Last but not least, Lets get into a some Nutrition and Diet Advice! **So, another topic we constantly get questions about is what to eat before bed as well as questions about how to keep GAINS through the night. We searched the internet and really loved this article by bodybuilding.com Check it out! Make sure your last meal of the day is a tasty, muscle-building one with these sweet recipes. When it comes to sustaining your gains overnight, slow-releasing protein is key. But eating a tub of cottage cheese is only appealing for so long. If you're tired of the same old, same old, these recipes for delicious and nutritious nighttime snacking are right up your alley. 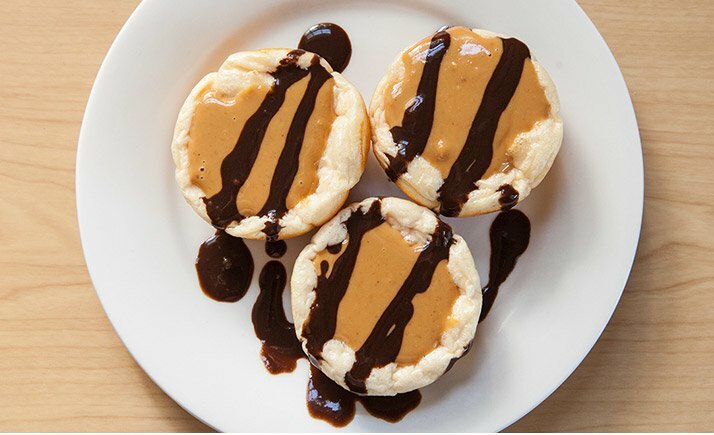 From bars and cake to mousse and chocolate-covered cups, these good-for-you dessert items have one thing in common: They're all baked with a whey-casein blend to feed your hungry muscles for hours! You can use our Division Supply HIBERNATE! Get ready to hit the kitchen and break out your food scale. After a little bit of baking, you can pass on the cheese tonight and enjoy something a bit tastier with these fantastic recipes! Check out their site for more info and great articles!